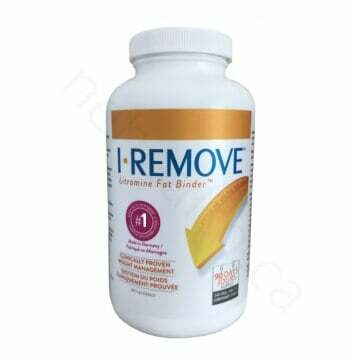 I-REMOVETM includes the patented Litramine Fat BinderTM — a proprietary blend of enriched cactus prickly pear and acacia-based fibre complex, scientifically demonstrated to reduce dietary fat absorption. 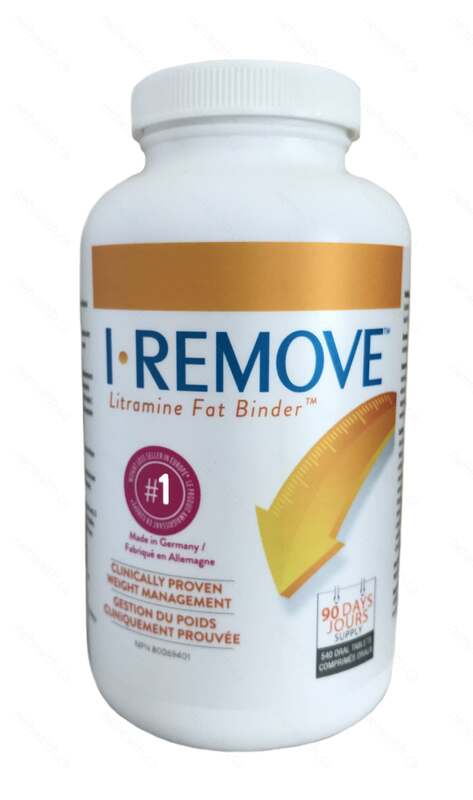 The binding properties of Litramine Fat BinderTM attract fat molecules and increase their elimination by up to 28.39%, promoting weight loss with results up to three times more effective than dieting and exercise alone. This product is Clinically proven, Gluten free and non-Gmo. Made in Germany. #1 weight loss seller in Europe!!! Get clinically proven proprietary complexes of natural compounds. Maintain weight goals long term and avoid the yo-yo effect. Intensify your weight wellness results by losing body fat — and not muscle mass. Microcrystalline cellulose, croscarmellose sodium, silicon dioxide, magnesium stearate. Adults：take 2 tablets with liquid, 3 times per day immediately after each main meal. Take 2 hours before or after taking other medication and/or natural health products. Take with at least 1 glass of liquid. Maintain adequate fluid intake. The product can also be used once your target weight is achieved. Take 2 tablets with liquid as needed — immediately a main meal. Do not exceed 6 tablets a day. Do not take this product during pregnancy or whilst breastfeeding/nursing or if your BMI (Body Mass Index) is below 18.5. As this product contains fibres, it is recommended that you take at least eight (8) glasses of water a day to avoid any possibility of constipation or stomach discomfort. If any of these conditions persist, please consult your physician. This product contains trace amounts of oxalic acids, which are found in many other green vegetables. If you have kidney disease or kidney stones, avoid taking this product on a regular basis. Consult your healthcare professional before taking this product if you have any existing medical conditions or taking any medications. If you have difficulty swallowing, consult a health care practitioner prior to use.